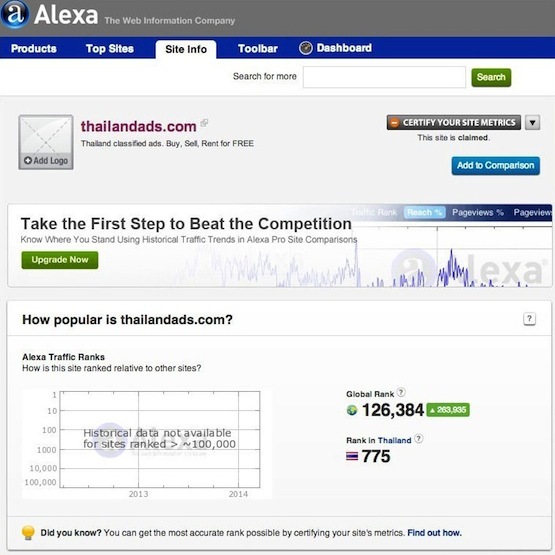 ThailandADS.com is now raked by Alexa as #83.746 website in the world. The rank in Thailand is #775. You can also see stats on Similarweb. People have for some time been asking us about Banner Advertising on ThailandADS.com. So therefore, we are now happy to present four packages. Size is 468 x 60 px. Your Banner will show on all pages on the site. Price: 60 USD per month. Size is 300 x 250 px. Appears on all pages, in all classified ads, in all blog posts. Note: Minimum term is 3 month. If you buy more than 6 months, we will give you 10% discount. If you buy 12 months we will give you 15% discount. (These prices are valid only if you pay it all at once). ThailandADS.com growing fast right now. So if you for instance buy a banner for 12 months, so we believe that you are doing a really good deal. We are planning a series of paid marketing activities in the future. Activities on Facebook and Google. Then it is likely that more visitors see your banner. Send us an email with your banner and link to your website. Payment is via Paypal, we will send you a link and you can pay with your Visa card. For the moment we have no discounts for the service Banner Advertising.